I promised to follow up this time with ideas on how to respond to the threat to eliminate hundreds of thousands of jobs that I wrote about in the End of the Road last week. That focused on truck, bus, and taxi drivers endangered by technology. But to defend these workers in the cross-hairs, I believe it’s necessary to see how they fit in to the broader transportation sector moving goods and passengers today. In doing so we will find ourselves not so much at the end of the road as at the intersection of class and climate struggles. Intermodal describes shipping the same load seamlessly through more than one mode of transportation–truck, rail, ship, air. The concept has been around for at least a century. The quasi-public Railway Express Agency that emerged from government operation of railroads during World War I offered local truck delivery of Parcel Post packages shipped by train on Post Office mail cars to end users. It flourished until inter-city mail started moving by air and OTR truck, which led to REA’s demise in 1975. TOFC (trailer on flat car) “piggy-back” rail transport between major cities has been common for decades. But it was the spectacular growth in Pacific Rim exports–and especially imports—that inspired the containerization revolution. Uniform sized containers could be stacked both below and above ship decks and quickly handled by giant port cranes. Each highly skilled and relatively highly paid crane operator performs work formerly done by dozens of longshore workers. The most dramatic example of this Intermodal great leap forward was the creation of a new Port of Los Angeles consolidating and reconfiguring the existing ports of Long Beach and San Pedro. As cranes unload ships they can re-stack on container-ready truck trailers. Most of these go only an initial short distance to a yard of the port’s own Pacific Harbor Line short-line railroad for transfer to container on flat car (COFC). From there it is only an 18 mile journey to the Alameda Corridor where most cars are divvied up between two giant carriers, Union Pacific and Burlington Northern Santa Fe, that serve destinations as far east as Chicago. For exports, the process is simply reversed. This marvel of efficiency is hardly cutting edge. It is an often frantic effort to keep up with technological revolutions of their customers in manufacturing, steel, mining, chemicals, agriculture, and even retail. Boasts of the Port of Los Angeles that their operation reduces road congestion that can save lives and wasted time have a grain of truth. But claims they are reducing greenhouse emissions are exaggerated. Both are based on simply replacing rubber on concrete with more steel wheels on rails—a good thing to be sure. But the sheer increased volume of ship, air and truck transport in the post-Great Recession economy has largely canceled out this modest benefit. Transportation is still responsible for about 20 percent of U.S. greenhouse emissions driving climate change–second only to electricity generation. Electrifying rail lines to replace diesel would yield much more substantial gains. But the trend has been just the opposite. In the 1930s there were 3,100 electrified route miles in the USA. Today it is less than 1,700. Their use is now almost totally restricted to Amtrak and commuter lines. Even the freight trains running on electrified track in the Northeast and Keystone corridors still use diesel. There are some near zero-emission electric local delivery trucks now in operation and both Cummins and Tesla are ready to take orders for electric semis suitable for short haul work. Batteries for over-the-road use are in development. But wide adoption of these improvements any time soon appears unlikely. So far, actual environmental benefits have been very modest and largely unintentional. Both trucking, and especially rail capital have strong vested interests in fossil fuels. Fighting climate change is not why the capitalists and government bodies that work for them have invested so much in transportation restructuring. Their goal is to increase the exploitation of the only class that creates new wealth—especially theirs. They have little regard for the harm this does to workers and their families or the irreversible damage done to our biosphere. They use technology to enable a steady, massive elimination of jobs in all modes of transportation as emissions across the global economy continue to rise. The Teamsters, Longshore and rail unions have been unable to use traditional collective bargaining to stop this hemorrhaging of good jobs. Most of their leaderships gave up long ago, instead seeking “partnership” with employers to maintain a well paid remnant of dues paying members. We still need unions in the workplace—and better union leadership. But it’s going to take more to realize the goal of the Labor Network for Sustainability—Making a Living on a Living Planet. The global Trade Unions for Energy Democracy calls for socialization of all energy under worker management. To achieve these objectives we can benefit from past and current experiences of our class siblings in Britain. The first British Labour Party majority government that came to power in the summer of 1945 after trouncing Churchill’s Tories 2-1 faced the challenge of recovering and rebuilding after devastating loss of life and resources during World War II. They didn’t want a return to British capital’s prewar legacy of mass unemployment and poverty. While not revolutionary they carried out a series of far-ranging social and economic reforms beneficial to the working class. This included nationalization of about twenty percent of the economy. Among the new state sector acquisitions were medicine, the Bank of England, coal mines, steel, electricity, gas, and telephones. And the Transportation Act of 1947 nationalized rail and canal shipping including their harbor operations as well as over-the-road trucking and bus lines. Along with already state-owned airlines, the Act developed an integrated national transportation plan. There are some valid criticisms of their methods—above all the absence of worker management of these industries as advocated in the party’s famous historic socialist “Clause IV.” But by and large they did a remarkable job in economic recovery and improving the lives of British workers. Their very success, however, made them tempting targets for subsequent privatization. The return of transportation and utilities to the capitalists has recreated the same kind of mess that we face on this side of the Atlantic. Trade unions and a resurgent Labour Party under a new left leadership are raising the demand for re-nationalization—often accompanied by the call for worker management. Most expect a Labour government will soon replace the Tories. A working class party—a labor party—is the indispensable missing ingredient needed for a transportation system that is not only efficient but also ecologically sustainable and leaves no transportation worker behind. * Sweating It—A soon as the home plate umpire shouts “play ball!” tomorrow evening at Dodger Stadium in Los Angeles a new World Series record will be set. The expected temperature of around 100F will mark the hottest start in the history of baseball’s Fall Classic. * Glad Grads—Finally overcoming objections and delays by the University of Chicago administration, U of C graduate student workers got their chance to vote in an NLRB representation election last week. It wasn’t close—1,103 to 479 in favor of Grad Students United, affiliated with the Illinois Federation of Teachers. This necessary first step now leads to the challenge of negotiating a first contract. The next WIR will be out around November 6. After posting on Labor Advocate tomorrow the same goes for our companion news blog. My time off is neither vacation nor sick leave. Its due to a major renovation project in our 127 year old house that includes my office. I’ll be monitoring e-mail on my lap-top but not much else. That’s the title of an excellent piece in The Guardian by Dominic Rushe focusing on over-the-road truck drivers. As well as being one of the most romanticized occupations it is the most numerous job title in the world’s biggest economy—1.8 million of them pilot their big rigs on public streets and highways. Another 1.7 million workers drive buses, taxis, and delivery vehicles. Their size and strategic importance within the overall economy will be crucial to the record breaking growth promised by Trump as a result of his tax cut, budget and deregulation policies. But, as this article discusses, big changes in this sector are looming that could lead to the loss of hundreds of thousands of jobs. The explosive growth of trucks replacing rail in moving most cargoes that began in the second half of the last century largely evaded unionism. The Teamsters Freight Division now claims only 75,000 members–and this includes dock workers, mechanics and some office personnel as well as drivers. Many OTR drivers are “independent contractors.” Because of the expense of tractors, a lot of them enter in to lease agreements with freight companies who require they only haul loads for them. Lease, fuel, and toll expenses are deducted from payments for work. Because they are self-employed, the “independents” have to pay both employer and employee contributions for Social Security, Medicare, Worker Comp, and even unemployment benefit funds. In 1980, the average trucker earned 38,618 dollars a year. Adjusting for inflation that would be 114,722 today. But the actual current average is only 41,340. For many self-employed drivers, if all hours of work, and idleness waiting for work away from home, are counted they are toiling for less than minimum wage and no benefits. Despite the help of Democrat “friends of labor” in this severe downgrading of once attractive “middle class” jobs, the employers are not satisfied that labor costs are still a third of their annual 700 billion dollar industry—and 75 percent of that third goes to drivers. Rushe explains how Silicon Valley is aiming to replace drivers with technology just as has been massively done in manufacturing, retail, rail yards, music, and even journalism. There is great incentive for the bosses to make the big initial capital investment. In addition to eliminating wages and benefits, computers don’t have to sleep, eat, use a rest room, are not tempted by alcoholic beverages—and never organize unions. There are already driverless cars and local delivery trucks in limited operation. Uber owns Otto, an automated truck company that expanded their horizon to over-the-road when they moved 45,000 cans of Budweiser 130 miles from Ft Collins to Colorado Springs last year. There have been much bigger successful tests in Europe. There’s no argument against the need for better, less congested roads. But the “holistic” perspective should be much wider yet. There would also be great environmental benefits if most goods and people now moving on highways traveled by rail—enhanced further where rail is electrified. And if that electricity was generated by clean, renewable fuels—well you get my drift. Lives would be saved as well. Presently, there are more than 41,000 traffic fatalities every year—more than all American deaths in the three years of the Korean War—the overwhelming majority due to driver error. While nonprofessionals are the biggest culprit truck driver fatigue is also a significant problem. Certainly there is much grumbling among drivers about the paper work they must keep current and mandated rest time that is usually unpaid. But neither Trump nor the ATA give a rodent’s rear end about the drivers’ complaints. Trump’s deregulation is aimed to intensify the exploitation of drivers—until they can be replaced with computers. In the meantime there will still be carnage on the road. There are effective measures that can prevent many driver errors without eliminating the driver. Most new cars now have optional computer controlled features such as emergency braking when collision seems imminent and automatic correction of drifting in to another lane. Some even offer hands-free parallel parking. Car companies could do more by eliminating such distractions as prominent Internet-connected touch screens. While not fullproof, this technology that watches and compensates for dangerous inattention should be standard equipment on all vehicles, including trucks. Since the days of the much maligned Luddites, capitalists have preached that opposition to technology is futile. Except for a UPS delivery wagon on Mackinac Island where most motorized vehicles are banned, no Teamsters today work with horses. But they quickly adapted to the introduction of motor trucks while keeping the same cool horse head logo. Organizing onboard computers, however, is not an option. While questions of how soon and how fast remain unanswered, the threat of massive elimination of truck, and also bus and taxi drivers, is real. The skills of their crafts are not readily adaptable to other occupations. They would add to the demographics of Trump’s purported working class “base”–“middle class” workers left behind by plant closings or living in fear of losing good jobs. In this regard, Trump is indeed just getting started. How can the working class respond to this menace? I plan to offer some ideas in the next WIR. * Appearance Canceled—The neofascist spiel of Milo Yiannopoulos won’t be performed live at Kansas City’s historic Folly Theater after all. His Troll Academy hate-spewing tour across the U.S. and Australia has sparked vigorous protests. The Folly explained their nixing was due to security concerns for their patrons and staff. * Who You Gonna Call?–Trump repeated the fake news on “social media” that Puerto Rican Teamsters had refused to move aid sent for victims of Hurricane Maria. 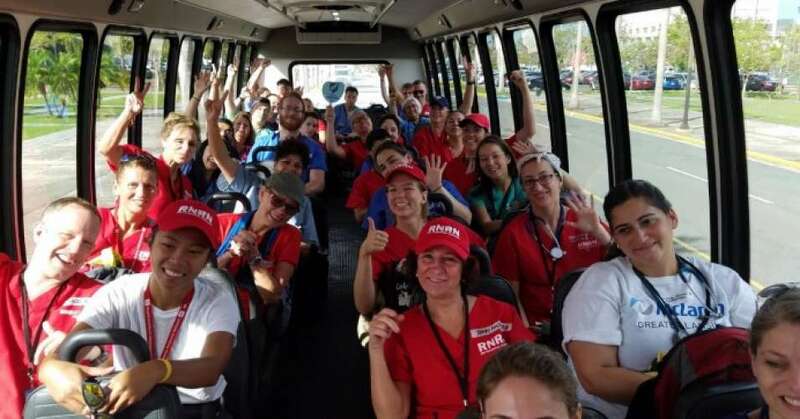 In fact more than 20 Teamsters and AFL-CIO unions immediately collaborated with the Puerto Rico Federation of Labor to send drivers, nurses, and skilled workers to pitch in. “I put out the call for help, and who listened? The unions,” said Carmen Yulín Cruz, the mayor of San Juan, the Puerto Rican capital.